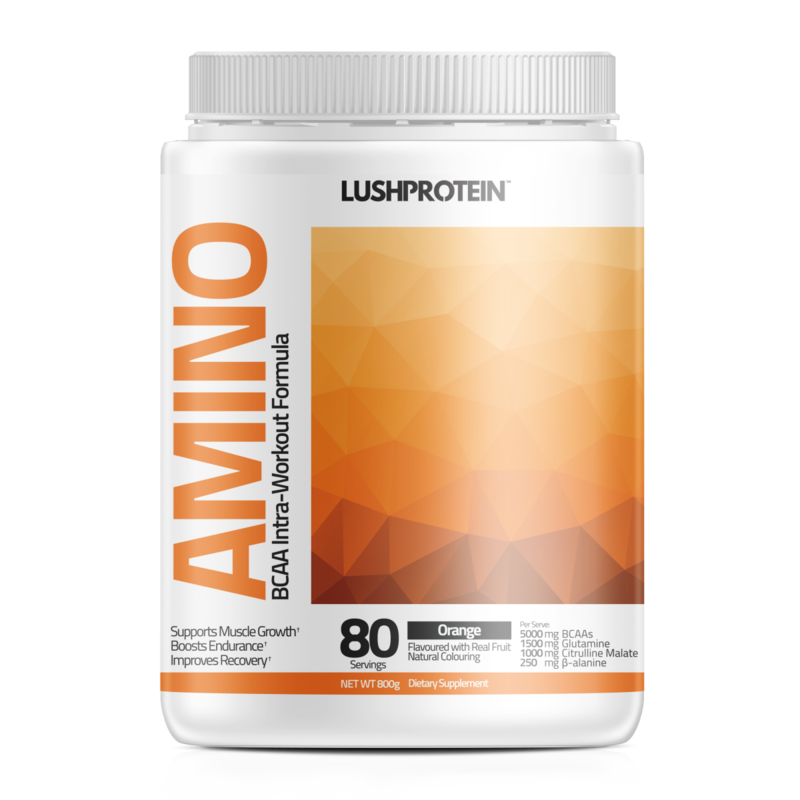 Lush Protein (AMINO Intraworkout - 80 servings) – Strength Apparel Co.
LushProtein™ AMINO is a refreshing sugar-free BCAA-based drink designed to help anyone grind through and get the most out of their gym or training session. Elite athletes, bodybuilders and fitness enthusiasts use LushProtein™ AMINO during their workouts to train harder, longer and recover from intense sports activities. LushProtein™ AMINO contains a blend of our proven pure amino-acids blended with real fruit juice powder for a refreshing taste. Each 10g serving of LushProtein™ AMINO contains 5g of BCAAs (branched-chain amino acids) in the proven 2:1:1 ratio. BCAA is crucial for supporting lean muscle recovery and also aids the prevention of muscle tissue breakdown. BCAAs are metabolised in the muscles they can be used directly as an energy source when required, delaying the onset of muscular fatigue. Boosts nitric oxide production, reduces muscular fatigue and enhanced muscular pump. Increases intramuscular carnosine and delays muscular fatigue. Essential for post-workout muscular recovery and supports your immune function. Aids amino acid metabolism. Important for cardiovascular, digestive, immune, muscular, and nervous system function. Replenishes electrolytes lost to sweat and essential to keep your body hydrated, to enhance performance, restore balance, and help prevent muscle cramps. Take LushProtein™ AMINO as a drink during exercise whilst training or sip it throughout the day on training-days to aid in muscle recovery. Suggested Use: As a dietary supplement, mix one scoop per 200ml of water. Shake well and consume during exercise on training days, or throughout the day on non-training days. Adjust number of servings as desired.